When Brian Richmond works in his laboratory in the basement of an anthropology research center on G Street, he has to duck beneath its low-hanging ceilings and shuffle in his team of 10 researchers to work one-by-one. But the chair of the anthropology department got word last week that he will have 50 percent more room when he works in the Science and Engineering Hall’s coveted lab space. 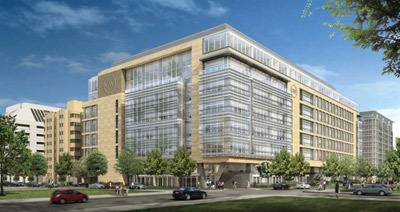 He and 117 other researchers will move into the building in 2015. In a yearlong process that generated enthusiasm from those moving into the building and drew irritation from those left out, administrators have sized up grant portfolios and weighed equipment needs to allocate research space. Another deciding factor for landing a spot in the new building was researchers’ tendencies toward interdisciplinary work. The Science and Engineering Hall will boast state-of-the-art equipment and facilities across 480,000 square feet, including a lab for nano-scale research, a clean room to prevent contamination and a three-story-tall “high bay” that will allow researchers to test how to make more earthquake-resistant bridges and buildings. Biophysics and biomedical engineering researchers will be rewarded with the most lab space in the $275 million structure because of their collaborative work, Senior Vice Provost for Academic Affairs and Planning Forrest Maltzman said. Nearly 63 percent of labs will go to researchers in the School of Engineering and Applied Science, while the rest will go to researchers in the biology, chemistry, physics and hominid anthropology departments in the Columbian College of Arts and Sciences. Columbian College researchers will lay claim to about 1,600 more square feet than engineers because science labs often need more equipment space than engineering labs, Maltzman said. Since January, representatives from Ballinger Architects have interviewed 177 science and engineering professors about their space needs and lab work to see who would mesh best with the design of the building, another factor in deciding lab space. Three committees of administrators and researchers focused on space, equipment and operations also helped guide the allocation process. The building will boast state-of-the-art equipment and facilities across 480,000 square feet, including a lab for nano-scale research, a clean room to prevent contamination and a three-story-tall “high bay” that will allow researchers to test how to make more earthquake-resistant bridges and buildings. More than half of the labs will go to researchers hired between 2010 and the building’s opening day, as the two schools look to draw in top scholars from interdisciplinary fields. The science departments in Columbian College will hire 26 professors – both tenure and non-tenure track – over the next three years. The engineering school has brought in 36 new faculty members over the last two years with plans to hire six more this year. But some professors said the criteria for nabbing research spots in the new building were not clear and questioned the logic of assigning space based on collaborative work. Gustavo Hormiga, a biology professor who works in Bell Hall, compared organizing lab space across disciplines to an “arranged marriage” and said some faculty did not support the decision if it meant disrupting collaborations going on within departments. Balancing delicate departmental concerns and questions of stretch amid limited research space has been on the minds of administrators and architects, Maltzman said. He defended the criteria for gaining lab space, which also include how much external funding a researcher pulls in, how the research coincides with the building’s design features and whether the researcher is a new hire. Maltzman said administrators tried to keep researchers informed through individual meetings with architects, reports to department heads and a few meetings with full departments. He added that administrators were taking steps to quell concerns, like guaranteeing departments the chance to keep offices together. “I do think it’s important for us to recognize that this is indeed a cultural shift. And there is a need to go ahead and make sure the cultural shift doesn’t occur so rapidly that it’s too unsettling,” he said. About one-third of science and engineering faculty will continue their research outside of the new building in existing labs on Foggy Bottom or on the Virginia Science and Technology Campus. In Duke University’s French Family Science Center, which opened in 2006 and houses mostly biology and chemistry along with some physics laboratories, interdisciplinary work has jumpstarted research, even with its physics department split between buildings, Duke’s physics department chair Haiyan Gao said. “We have roughly 30 faculty in the department and I can tell you, in the new French Family Science Building, we only have four faculty offices. Did this create any kind of tension? I don’t think so,” Gao said.